In 2013, fu-GEN Asian Canadian Theatre was celebrating their 10th Anniversary Season. As the only professional Asian Canadian theatre Company in Canada, I felt that it was not only important, but necessary that these 10 years be documented. I produced this mini-documentary in celebration of the work that they have accomplished over the last decade. They have trained generations of theatre artists, whose work continues to push the boundaries of the art form. My goal was to share the personal stories of the people whose lives fu-GEN has impacted over the last ten years and how the community has grown since the company's inception. Every birthday needs a party, and for fu-GEN's 10th Anniversary, they celebrated in style with a Season Launch at Daniels Spectrum in Regent Park. It was a joyous night that included a staged reading of Yellow Fever, the first asian-canadian play ever produced in Canada. Artistic Director David Yee spoke about the season's theme of Home, and how fu-GEN was created to be that space for asian-canadian theatre artists. This video was produced to commemorate that evening, but also to invite audiences into our 'home' to spend the season. We asked strangers on the street, "Would you like to be in a Youtube video? All you have to do is read my signs." In 2016, I was the Marketing Director for the World Premiere of Kawa Ada's play The Death of Mrs.Gandhi and the Beginning of New Physics (a political fantasy) at the Next Stage Theatre Festival. I created original video content and media that was shared across multiple social media platforms. The Death of Mrs.Gandhi was praised for being, "consistently witty, virtuosic in its composition." With support from the Theatre Ontario Professional Theatre Training Program, I trained under Cahoots Theatre AD Marjorie Chan in Outreach. We developed outreach programming for Cahoots' 2015/16 Season in conjunction with their production of Ultrasound by Adam Pottle. 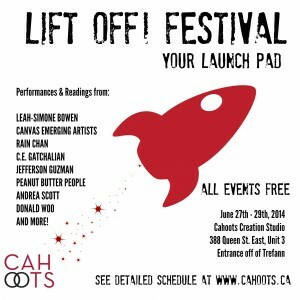 In June 2014, I acted as Festival Coordinator for the Cahoots LIFT OFF! Festival. I ensured that things ran smoothly over the packed 3 day festival, which included public readings, an open rehearsal and community receptions. Aneemah's Spot enjoyed its World Premiere at the Summerworks Performance Festival in 2012. A co-production between Motionlive and cric crac collective, Aneemah's Spot went on to win the RBC Arts Professional Award. My duties as Associate Producer included managing social media marketing, acting as Media Contact, writing and distributing the offical press release and producing the Aneemah's Spot promo video, seen below.